-LED Lifespan:50,000 Hours or More. 1.Use the AC adaptor to power the light anywhere household power is available. Simply plug the single pin at one end of the adaptor cord into the direct power port on the unit, Plug the main adaptor body (with prongs) into a standard 110V-240V wall outlet. 2. The LED indicator positioned next to input port will illuminate red when the unit is operating from direct AC power. 3. Only use the AC adaptor provided with this unit to power the unit, Using a different AC adaptor may damage the unit and will void the warranty. 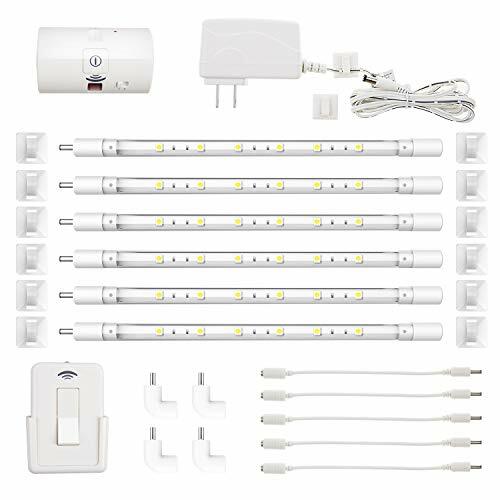 ★【SUPER BRIGHT & ENERGY SAVING】The post assembling set of under cabinet light is 9W, 1000Lumens, 6000K white glow, contains 36 super bright SMD LEDs，Perfect night light for counter, kitchen, closet, shelf and hallway, it is the best choice for indoor using. ★【DIY CONNECT BY POWER MODULE】 Connect the strip lights by plugging them one by one into a connection point on the power module(right or left side). Powered on AC adaptor. Connect the safe lights into different patterns as you like. Each bar light can be rotated 360°freely. ★【BRIGHTNESS DIMMABLE AND MEMORY FUNCTION】 Power module and remote control must be preset at the same position(I or II). Press touch switch or use remote control to change the brightness from 100% to 1%（in recycle）, and it can memorize your last brightness. ★【EASY TO INSTALL】Use the EZ-Mount clips to hold the counter light securely in place, connect each light with connector wire or L connectors, make it easy to go around corners and design your own lighting configuration. ★【LIMITED 12 MONTH WARRANTY】12 months warranty and very friendly customer service whenever you need, we agree to return goods and refund for any reason within 30 days. If you have any questions about this product by HONWELL, contact us by completing and submitting the form below. If you are looking for a specif part number, please include it with your message.